PETALING JAYA (Dec 27): A total of 78 residents of Tiara Faber Condominium and Desa 1 Residences in Taman Desa have lodged a report with the Malaysian Anti-Corruption Commission (MACC) today to investigate the conversion and subsequent sale of land to a private developer. According to a press release today, the residents who filed the report want the MACC to investigate how the land — gazetted as TNB reserve under the previous Kuala Lumpur Master Plan and subsequently designated as a green area under the Kuala Lumpur Master Plan 2020 — was converted to development land and sold to a developer who plans to build The Address condominium on the site. In addition, the residents hope that the commission will also review the process taken to approve such a high-density high-rise development on such a narrow piece of land, which is very close to residential properties and schools. The Address comprises three towers of over 30 stories that will come up on a 132-ft-wide parcel originally earmarked as a TNB reserve. 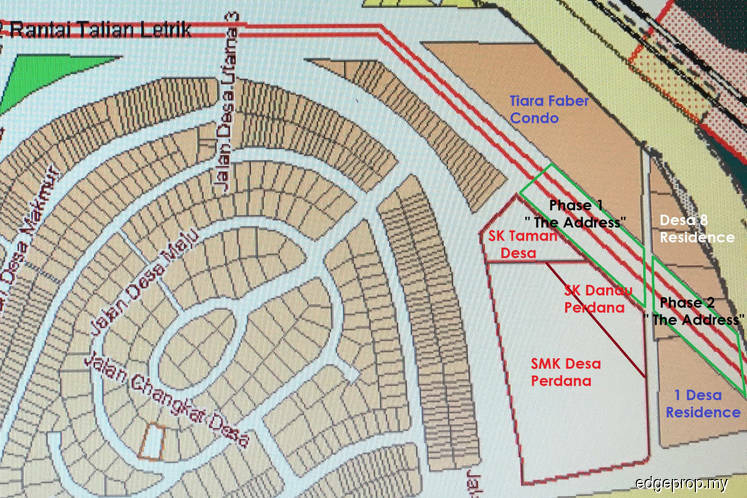 The site borders a few low-rise condos, namely Tiara Faber Condominium (10 stories), Desa 8 (12 stories) and Desa 1 Residences (13 stories), as well as two primary schools and one secondary school. The Address has also received Dewan Bandaraya Kuala Lumpur’s (DBKL) approval to increase the area’s density from 60 persons per acre to over 650 persons per acre. “Over 200 residents had attended the Kaedah 5 hearing in DBKL on Sept 21, 2016 and over 40 questions were posed to DBKL. DBKL had promised to call for a second hearing to respond to the questions but there is nothing from DBKL. “Following the above when residents discovered from the Ministry of Housing and Local Government On-Line OSC Portal that DBKL had given approvals to the developer, residents decided to file for a judicial review against DBKL for the decision to allow development which is, as residents puts it, unsustainable and ridiculous. “With such irregularities from the time the first notice under Kaedah 5 [where DBKL gathers feedback from residents and other stakeholders in cases of land conversion and density increases] was put up back in August 2016, [and the] non-response by DBKL to residents, it gives the impression that there are irregularities and improprieties that give rise to the need for a report to MACC,” said the statement. The residents also urged Federal Territories Minister Datuk Seri Utama Tengku Adnan Tengku Mansor to fully disclose how the land transaction took place, including its conversion from TNB reserve land to development land, and the justification for such a high-density upmarket residential development in an area planned and developed in the 70s and 80s. Moreover, the residents also refute Tengku Adnan’s explanation that the DBKL land sold to developers was done under the RUMAWIP programme, which aims to build affordable homes for the lower-income group in Kuala Lumpur. “The Address is definitely not an affordable housing project,” said the statement. Valerie Low, a spokesperson for the residents lodging the report, said the developer did not put up the necessary project notices as required by DBKL when work started on the site and sign boards were put up only after complaints was lodged. Till today, the information on the signboard remains incomplete — the approval references are not included and DBKL appears to be closing a blind eye to this, said Low, who is a resident of Tiara Faber Condominium.